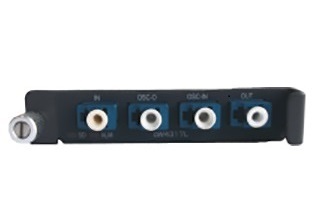 Optical Amplifier uses proven Erbium-Doped Fiber (EDF) technology to allow amplification of an optical signal without the use of costly regenerative repeater stations. Hence, it's distinct advantage is that it increases the allowable distance between each site before signal begins to degrade. The transmission distance is more than 100km before the signals need to be regenerated. Diagram below show different type of amplifier and it's position along the transmission distance. 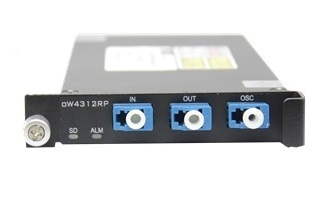 Typically, eWAVE provides 3 different type of Optical amplifier for long distance transmission. Amplified DWDM systems experience accumulated delay induced by chromatic dispersion on long fiber spans. Dispersion Compensation Modules (DCMs) are used to control this delay. Chromatic dispersion is predictable and stable and can be compensated for using dispersion compensation modules. 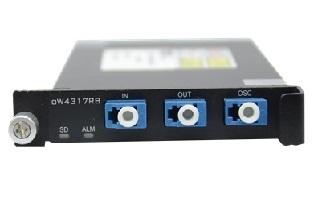 A single-slot DCM module is simply added to the system as needed. eWAVE DCM's have low insertion loss, exceptional linearity and low latency. They can be placed anywhere including pre, post or mid stage applications.